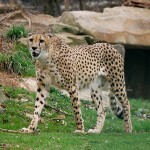 The cheetah is most famous for its speed. It is the world’s fastest land animal, having been known to run at speeds up to 70 mph. For instance, the spine of the cheetah is flexible enough to act as a spring when the cheetah runs. Visit the Big Zoo site for more info. Please login or register for COLLECTION OF TOUCHSTONES AUDIO LESSONS or TOUCHSTONES - Cheetah to view this content.